Thanks. That's the plan. However, I wasn't going to go with a furler but a sock instead. The sock is fine if you buy an off the shelf sail. If the sail is made for your boat you can add a little extra over the sock and buy the furler. They can be detached and used on a light upwind sail (Code Zero-likes). Very convenient if your sailing plans include any extended light wind sailing. The other good thing is that you can furl and unfurl those light sails when you are shorthanded / from the cockpit, and you can leave them furled sails out there till a more convenient moment when you drop the whole thing. None of these easily achievable with the sock. So, if you plan to use the light sails extensively and if you can afford the (not so huge) difference, think over going for the furler. A gennaker will be a lot easier and so you will use it more. Having a spinnaker up requires paying attention and some work too! By the time I would get one up I was ready for a siesta, not ready to keep my neck craned up watching the trim! Much of the time you can use a Gennaker without a pole too. Yeah, there's nothing like barreling along with a spinnaker in 15-20 knots of wind, but that's for racing with a crew if you ask me! Thank you for your comments on that. I thought I would need a permanently installed furling unit which then adds more hardware, weight aloft and windage but if it is removable it definitely makes sense. How much extra do you think I would be looking at? Yes, that was my experience. My son, who is my main crew member, always groans when I say we are putting up the spinnaker. It is definitely on my list. Quite expensive here in the UK but takes all the hassle out of spinnaker work. No poles, dead easy to gybe. This boat overtook me today like I was almost standing still. Boat: Le Guen Hémidy, Lévrier de mer, 16 m / 53 ft, "AZAWAKH"
Something I am about to try with our asymetric is to gear it at the bowsprit instead of using the pole...for those who already tried it, is it OK or will I have some trouble to do so ? (...) How much extra do you think I would be looking at? The bigger the boat, the bigger the difference. I looked at one size up too and the difference was 600 vs. 850 USD. To learn how much it is for your boat, just search the web, or walk into your local sailmaker/rigger/chandlery and ask for a quote. Remember that furl'able genn / code zero must have a special line in the luff (so it is a good way if you order new sails), while the sleeve can be used over any sail (again - strong point if you already have the sail). The downside of the sock is that it is a one trick pony - light upwind sails cannot be socked and re-using the same sock if you have more than one kite is an issue too. Interesting. I asked my sail maker and searched the internet prior to your response. My sail maker said roughly $2000 for furler (unspecified make) but I saw that CDI has one for half that. So I guess it pays to shop around. BTW, I saw that North Direct (and others I guess) have over-the-counter Gennakers for about $1050 for my boat (made in Sri Lanka I suspect) which is half the price I was quoted for a custom made one. Does any one have experience with these mass produced sails? While it would be nice to a pick of design and colours, saving a grand is even nicer. The units can be normally had cheaper from big sail makers if purchased as a kit with a new sail or during special events/promotions. A good of the shelf sail is as good as good as one made to measure, provided you will find the right fit. Buy from a trusted source and one where you can inspect the sail prior to spending your money. Does any one have experience with these mass produced sails? While it would be nice to a pick of design and colours, saving a grand is even nicer. Probably most non-racers are using "mass produced" sails. On my boat all the sails are mast produced. I don't really see any sense to pay more for a custom spinnaker. What difference would you really expect between them? Maybe 2 extra square feet or something. I don't really any sense to buy more for a custom spinnaker. What difference would you really expect between them? Maybe 2 extra sqquare feet or something. Ya, I agree. Really, the only "benefit" would be that you can choose your style but the sail would likely be the same. It is good to know. That is really cool. I bet they are expensive. Yes they are expensive. It will cost nearly $9,000 US for a Parasail designed for a 39 foot boat. I'd go with a Gennaker/Reacher/Drifter/Code zero rather than an Asym. My limited experience with our Asym hasn't impressed me with it's windward ability. Handling it with a ATN snuffer has been a breeze. Think a gennaker on a furler would be a much more useful sail over a wider range of wind speeds and direction. 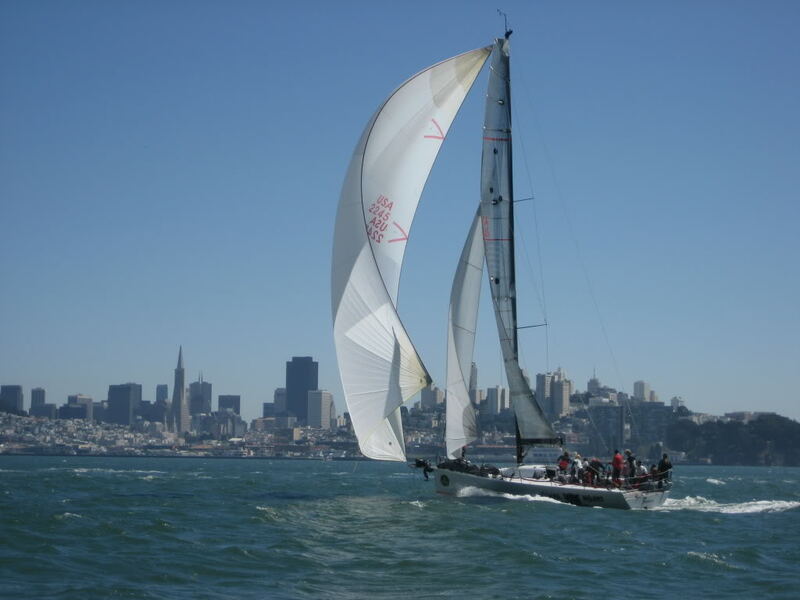 If you have the ability to set the sail with a furler on a sprit, think that's the way to go. With that set up, you can leave it up so you can deploy it any time that you want. Especially nice on those days when the windspeed and/or direction is changeable. Only take it down when conditions dictate or you don't anticipate needing it. As far as price for the spinnaker and sock. Have bought a couple of spinnakers in VGC for my 35' boat for $300 range. Have seen them from $200 to well over a $1,000 depending on condition and size. Sold one with a 50' hoist and sock for $500. Bought an ATN sock for $250 and a Chute Scoop for a $100. Personally, if you have the time, I'd haunt Ebay, the used sail sellers and Craig's List for a sail. Have seen an Asym that looked to be in VGC for $500 recently. check the used sail lofts like Bacon's in Annapolis. Lots of used symmetrical chutes for sale! All times are GMT -7. The time now is 00:51.